Peel uncooked shrimp. Sauté onions and celery in butter. Add milk and blend. Remove from heat then add egg yolks and blend. Now add shrimp and cook for 5 minutes. Next, add cheese, salt, and pepper. 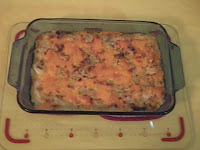 Pour mixture into a casserole and top it with more cheese. Bake long enough to melt cheese. Serves 6 to 8. This can be served over cooked rice or toasted bread.